The legendary Manny Pacquiao looked to keep his name relevant amongst the top fighters in the welterweight division as he took on Adrien Broner for the WBA “Regular” Welterweight Title in the main event of tonight’s Showtime PPV offering. Three undercard bouts took place before the main event, and the last fight didn’t end until around 12:15PM. A video package was shown beforehand further adding to the delay before to the start of the main event. The national anthems were sung beforehand, first the Philippine national anthem followed by the national anthem of the United States. The fighters began their walk into the ring at 12:34; with Broner entering first and Pacquiao entering second. Broner looks to be the bigger fighter of the two, even though Broner has historically fought at a lower weight. Pacquiao rushes forward and Broner ties up. Pacquiao rushes forward with another combination and Broner ties up. Broner lands a short left lead hook. Pacquiao is pushing his punches a little bit. Broner lands a straight right hand. Pacquiao lands a straight left to the body. Pacquiao lands a short right hook followed by a straight left to the body. Pacquiao throws out a straight left hand to the head of Broner. 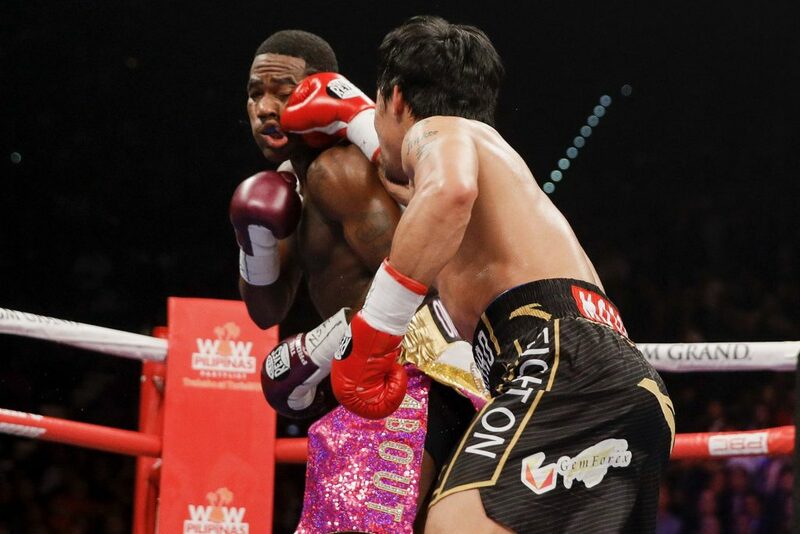 Broner may have tagged Pacquiao with a right uppercut. Pacquiao misses with a jab to the head. Pacquiao more active than Broner this round. Pacquiao looks a little slower today than in previous fights. Pacquiao pressing Broner backwards. Broner barely misses with a sweeping left hook. Pacquiao paws out a few jabs, and Broner lands a good straight right hand. Pacquiao lands with a jab and rushes forward with a combination. Pacquiao rushes forward with a three punch combination and lands the last punch. Pacquiao lands another quick jab. Pacquiao rushes forward with a combination and Broner backs away. Pacquiao lands a good double jab left hand. Broner barely misses with a sharp straight right hand. Pacquiao is going for the body but diving in a bit. This was a closer round. Pacquiao is active with his jab so far, lands a good short hook to the body. Broner misses with a check hook. Pacquiao lands a good straight left hand before Broner clinches with him. Pacquiao lands another straight left hand. Broner barely misses with a lead straight right. Broner lands a good jab followed by a straight right hand. Pacquiao lands a good left to the body followed by a left hook upstairs. Pacquiao lands another combination led by a jab. Pacquiao lands another good jab followed by a right hook to the head. Broner lands a good straight right hand. Pacquiao lands a good power jab on Broner. Pacquiao is very aggressive this round. Pacquiao is still the aggressor, but gets tagged with a good counter right hand when Pacquiao went to the body. Pacquiao lands a good straight left to the body but Broner counters again. Pacquiao lands a good straight right in the middle of a combination. Pacquiao lands a good quick jab and closes the distance on Broner. Broner is looking for his counter. Pacquiao gets tagged with another good straight right hand. Broner lands another good straight right hand. Pacquiao rushes forward and gets spun around. Pacquiao lands a short jab. Good check right hook by Broner and then Broner counters. Good round for Broner. Broner had a strong fourth round. Broner throws out another good straight right hand to the head of Pacquiao. Broner lands a good jab on Pacquiao. Broner lands another straight right hand, but Pacquiao follows that with a good jab. Broner barely misses with a left hook. Pacquiao is landing with his right hand off his combinations. Pacquiao jab I slooking better this round. Pacquiao lands a left to the body. Pacquiao lands a good left hook on Broner, and Broner answers with a jab. Pacquiao barely misses with a left cross, but lands a quick combination afterwards. Broner looks like he’s close to landing a power counter. Pacquiao is pressing the fight and looking to get in close to Broner. Pacquiao lands a good quick combination. Pacquiao lands a good straight left to the body of Broner. Pacquiao lands another good left hook to the body. Broner misses with a counter right hand. Pacquiao lands another good left to the body. Broner misses with a lead straight right. Pacquiao with another straight left to the body. Broner barely missing with his lead right hands. Pacquiao lands a good jab, followed by a two punch combination. Broner lands a good straight right. Pacquiao answers with another left to the body. Broner ends the round with a good two punch combination. Pacquiao is pawing with his jab and throws another straight left hand to the body of Broner. Broner barely misses with a straight right hand and Pacquiao barely misses with a straight left hand. Pacquiao is pressing forward on Broner again. Pacquiao is the first to throw most of the time when they are in range. Pacquiao simply outworking Broner right now. Broner lands a good right uppercut to the body of Pacquiao. Pacquiao connects with a left on a rushing combination. Pacquiao lands some good combinations on Broner with his back against the ropes and Broner tries to hold on. Pacquiao lands another good left cross on Broner. Pacquiao jumps on Broner by the corner and Broner holds on again. Pacquiao lands another combination on Broner by the corner. Very good round for Pacquiao. Pacquiao looks like he has a bounce in his step. The crowd is loudly chanting for Pacquiao. 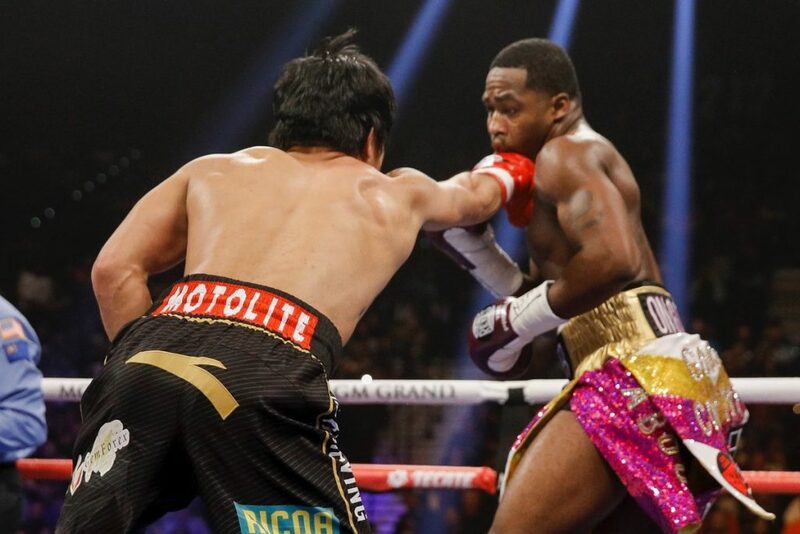 Broner lands a good counter right followed by an uppercut, but Pacquiao lands a good counter left hand off of that. Pacquiao looks to be rushing his power shots a little bit. Broner lands another good straight right hand. Broner has his senses back. Pacquiao double pumps a jab. Pacquiao lands a good counter right hook and then goes to the body. Pacquiao lands another good jab on Broner. Pacquiao lands a short left hook. Broner misses with a lead right hand. Pacquiao lands a good left to the body of Broner. Pacquiao lands another shot to the body of Broner. Close round. Pacquiao continues to be aggressive with his jab and his shots to the body. Broner is missing his target by inches. Pacquiao throws another straight left to the body. Pacquiao lands a hard left hand on Broner who then shoots in on a single leg takedown. Broner barely misses with a straight right counter again. Broner lands a good counter right hand on Pacquiao. Broner keeps his hands up high and lands a good counter straight right hand. Pacquiao throws out a lead right hook . Pacquiao lands a hard straight left hand on Broner and has Broner back to the ropes. Pacquiao shows off his hand speed and lands some good combinations on Broner. Broner ties up with Pacquiao. Broner flicks out and lands a good jab. Pacquiao lands a quick jab. Pacquiao throws out a good straight left to the body. Pacquiao has been showing good upper body movement all night. Broner lands a good jab on Pacquiao. Pacquiao lands a left to the body off of a combination. Broner lands a good up jab on Pacquiao. Pacquiao is really attacking to the body this fight. The crowd is chanting for Pacquiao again. Broner lands a good straight right hand on Pacquiao. Broner connects with another good straight right hand. Broner flicks out another counter left jab. Better round for Broner. Broner probably needs a knockout to win the fight at this point. Pacquiao lands a short jab. Broner lands a good jab but issues with a combination afterwards. Pacquiao lands a good counter left. Broner is backing away from Pacquiao despite being down on the cards. Pacquiao misses with a wild left hook. Pacquiao lands a combination and Broner ties up. Broner lands a good jab. Pacquiao with a straight left to the body of Broner. Broner misses with another straight right hand. Pacquiao has Broner backing away. Broner missing with his shots. The crowd begins to boo Broner for bicycling away from Pacquiao. Broner lands a decent counter right hand. Broner was backing away most of the round. Final round of the fight and Broner thought he won the last round. Pacquiao pressing forward and lands a straight left to the body. Pacquiao lands a good left hand to the chin of Broner. Broner misses with a straight right hand. Pacquiao lands another short left hand. Broner is circling away and lands a body shot, the referee warns him for a low blow. Pacquiao rushes forward and Broner ties up again. Pacquiao lands a good jab. Broner misses with another jab on Pacquiao. Broner has not been very accurate. Pacquiao lands a two punch combination on Broner. Pacquiao is still showing good movement at the age of forty after twelve hard rounds. Broner raises his hands after the fight, but its hard to imagine him wining.